BMW’s venerable Boxer engine enters yet another generation for model year 2019 with the advent of the R 1250 GS and R 1250 RT. 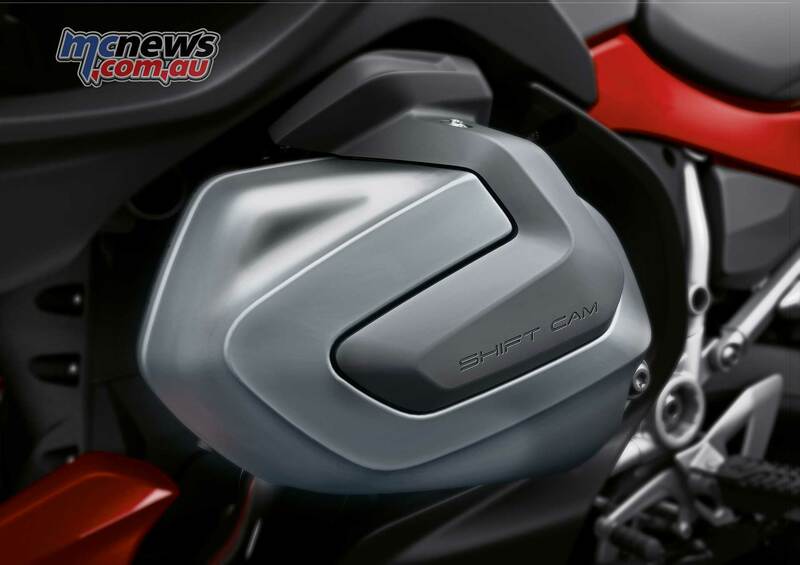 Now for 2019 the engine gains more capacity, growing from 1170cc to 1254cc, via both a longer stroke and an enlarged bore, and gains 9 per cent more power along with 14 per cent more torque. 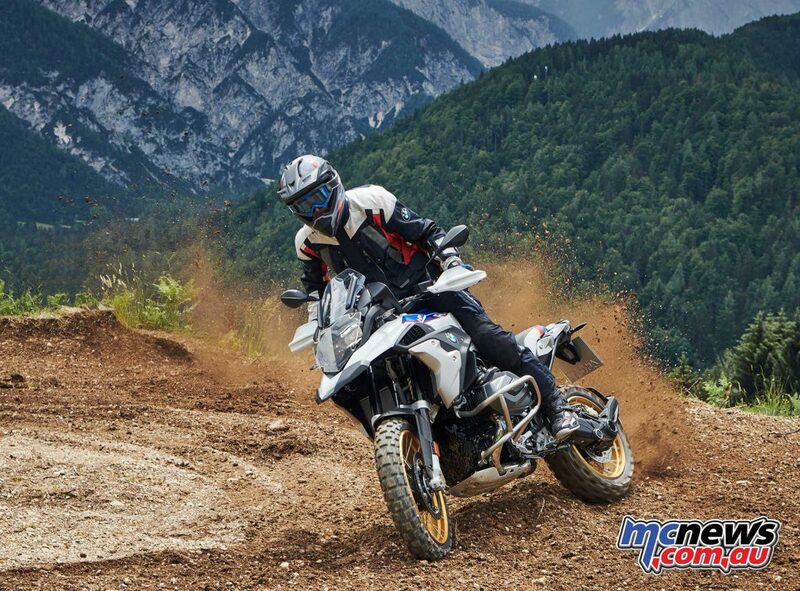 While the previous boxer power unit itself provided supreme forward thrust in all situations, the boxer engine in the new BMW R 1250 GS and R 1250 RT takes this a significant step further. 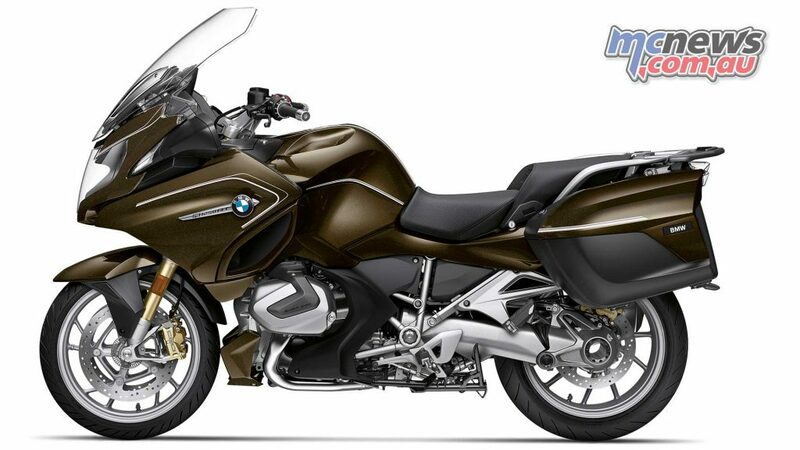 In the latest generation it has a capacity of 1 254 cc (previously: 1 170 cc). The ratio between bore and stroke is now 102.5 to 76 mm (previously: 101 to 73 mm). It has an output of 100 kW (136 hp) at 7,750 rpm and generates a maximum of 143 Nm at 6,250 rpm (previously: 92 kW (125 hp) at 7,750 rpm and 125 Nm at 6,500 rpm. With a 7% capacity increase, the new boxer engine offers 14% more torque and 9% more output than its predecessor, making it the most powerful BMW boxer engine ever to be manufactured in serial production. The varied configuration of the cam geometry also enables variation of the intake valve stroke. 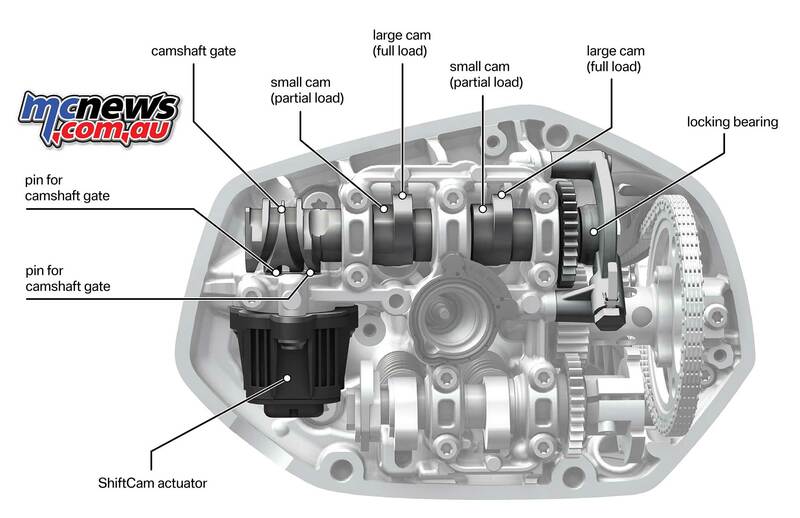 While the full-load cam provides maximum valve lift, the partial-load cam delivers reduced valve lift. 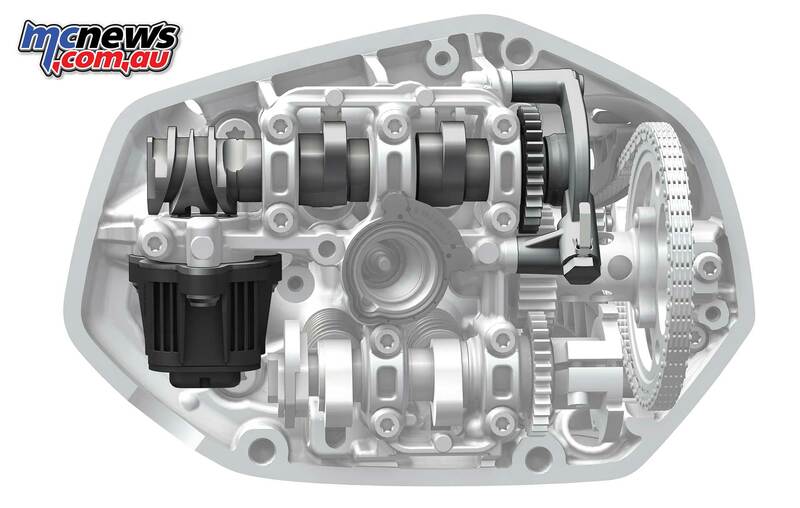 There is also a difference between the intake cams for the left and right-hand intake valve in lift and angular position. This phase shift means that the two intake valves are opened to different degrees and on a time-staggered basis. The effect of this phase shift is to create a swirl and therefore greater agitation of the fuel-air mixture flowing into the combustion chamber. This results in particularly effective combustion and better utilisation of the fuel as a result. Given the appropriate riding style, BMW ShiftCam Technology enables a reduction of fuel consumption by up to four per cent as compared to the already economical predecessor model. 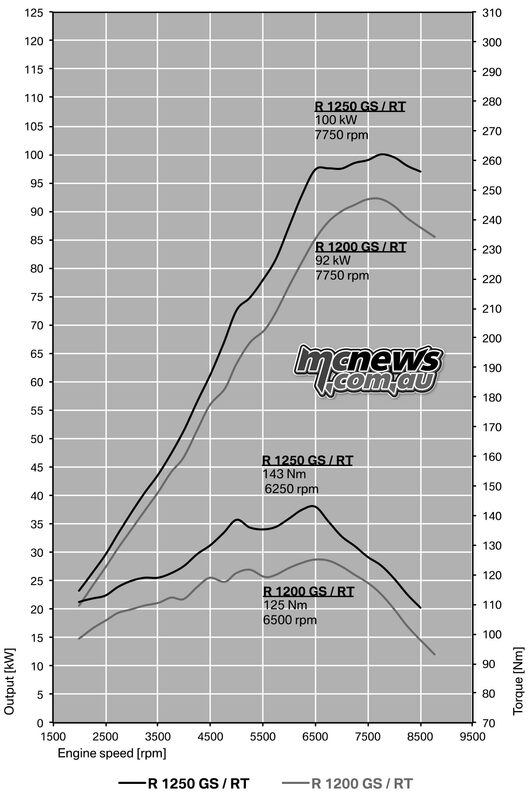 Reduction of fuel consumption by four per cent as compared to the predecessor model. In the range from 2 000 to 8 250 rpm, for example, the level of torque now available is 110 Nm. Within the range that is especially relevant in terms of riding dynamics, namely 3 500 to 7 750 rpm, the impressive level of over 120 Nm is now available. This gives the new R 1250 GS and R 1250 RT even greater supremacy and pulling power than before, combining absolutely superior power delivery with remarkable top performance – whether riding alone or with a passenger, on winding country roads or covering long stages of a journey at a high average speed. In short: never before has a boxer engine provided this level of riding fun and refinement. 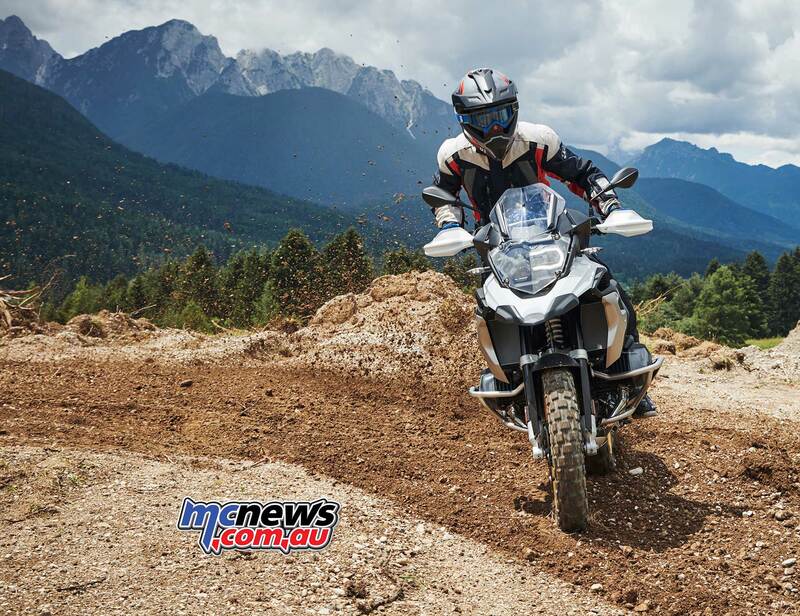 The engine of the new BMW R 1250 GS and R 1250 RT also features vertical flow. The advantage here is that the configuration of the intake channel no longer depends on the camshaft control, so it was possible to realise identical intake lengths for both cylinder sides. What is more, the fuel injector is now arranged so that the fuel is injected as directly as possible in front of the intake valves for optimum atomisation. As before, the two camshafts per cylinder side are powered by a chain running in the shaft behind the cylinders (on the right-hand side of the engine via the counterbalance shaft and to the left via the crankshaft). 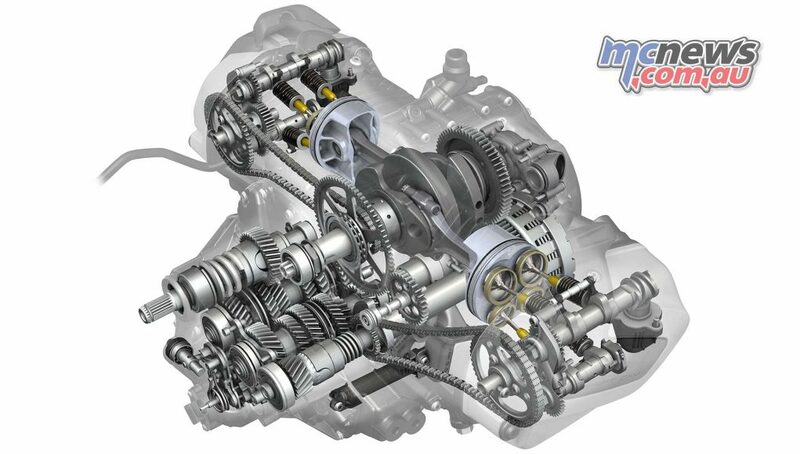 The timing chain drives an intermediate shaft between the intake and exhaust camshaft and it is from here that power is transmitted to the camshafts via spur gear pairs. The control chain is now a toothed chain (previously: roller chain) with the aim of further reducing running noise. As before, the four valves are arranged at close angles to one another in order to achieve an optimum combustion chamber shape. The valve angle is 8 degrees on the intake side and 10 degrees on the exhaust side, while the disc diameters of the valves are 40 mm on the intake side and 34 mm on the exhaust side. The valve shaft diameter is 5.5 mm. 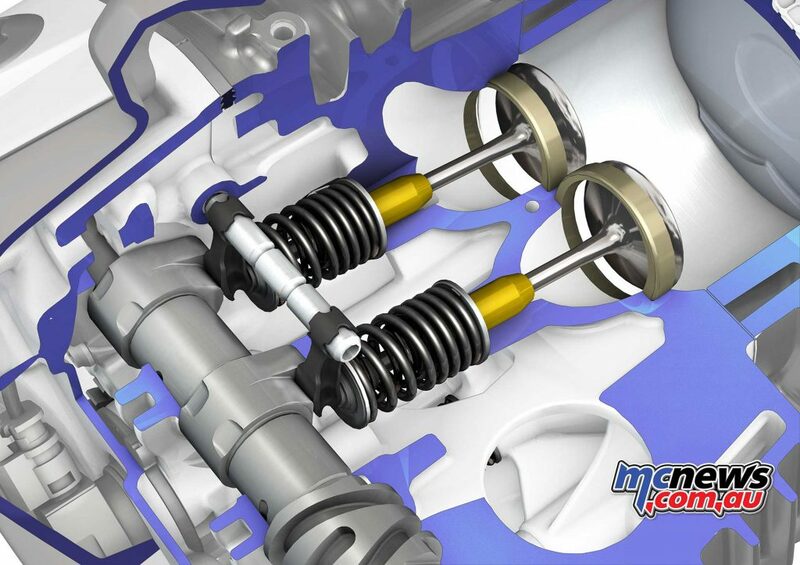 As before, the valves are operated via light, speed-resistant rocker arms, the design of which was derived from the high-performance 4-cylinder engine of the BMW S 1000 RR. The valve clearance settings are made by means of replaceable shims. Unlike their predecessor models, the new R 1250 GS and R 1250 RT have a knock sensor system in the form of two knock sensors. This allows the use of fuels with a rating of less than RON 95 – a particular advantage when travelling in the more remote corners of the planet. 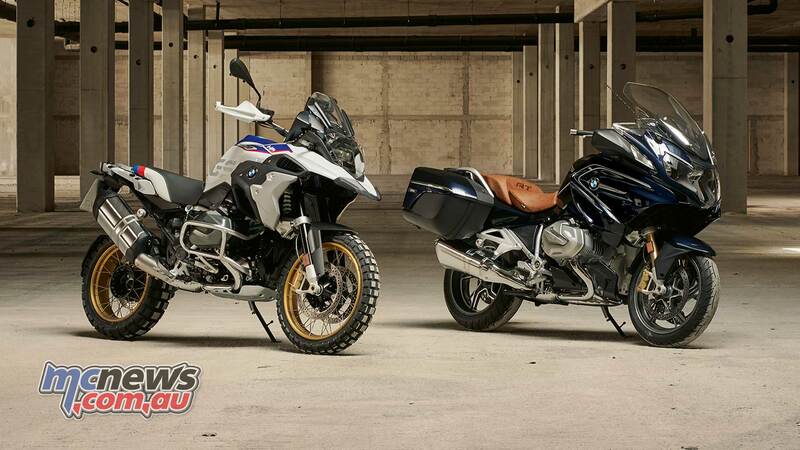 The new R 1250 GS and R 1250 RT are also fitted with a new digital engine control, the so-called BMS-O. Its main features are fully sequential injection, a compact layout and low weight. Carburetion is carried out by an electronic fuel injection system via throttle bodies with an opening width of 52 mm. Injection is via new twin-jet injection valves that support even greater refinement and further improved emission levels. 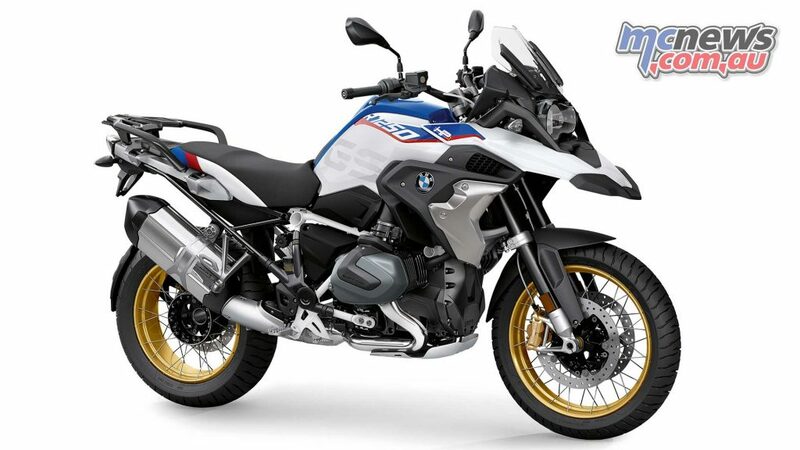 Made completely out of stainless steel, the exhaust system of the new R 1250 GS and R 1250 RT is designed entirely for optimum output and torque in conjunction with BMW ShiftCam Technology and works according to the 2-in-1 principle. In this development area, a homogeneous output and torque curve and thus excellent ridability were once again regarded as requirements for supreme performance on country roads, off-road riding and extended touring activity. Even in standard trim, the new R 1250 GS and R 1250 RT offer two riding modes for adaptation to individual rider preferences. Here, the standard Automatic Stability Control ASC ensures a high level of riding safety due to excellent traction. What is more, the riding modes “Rain” and “Road” allow adaptation of the bike’s properties to most road surface conditions. The set-off assistant Hill Start Control is likewise a standard feature in both models, enabling convenient set-off on slopes. ABS Pro (part of the optional equipment item Riding Modes Pro in the R 1250 GS and a standard feature in the R 1250 RT) also offers even greater safety when braking, especially in banking position, while Dynamic Brake Control DBC provides the rider with extra support on brake manoeuvres. DBC increases safety when braking, even in difficult situations, by avoiding unintentional acceleration from the throttle. 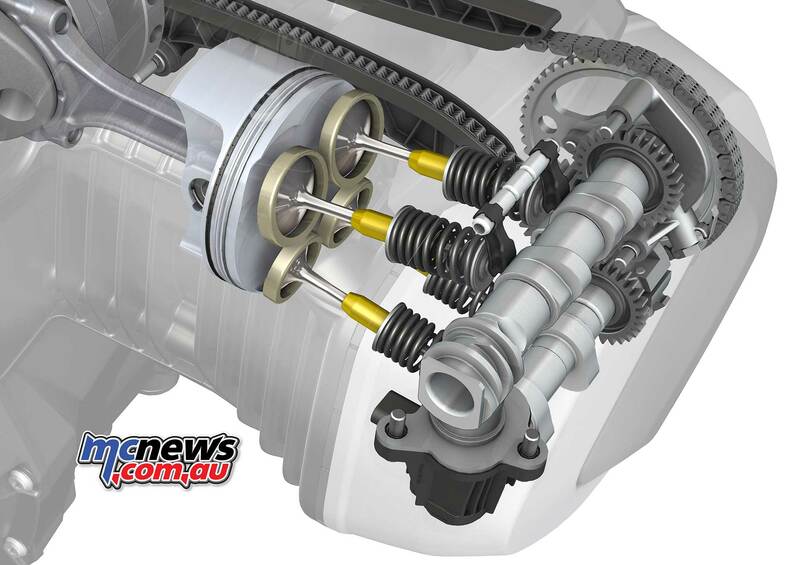 By means of intervention in the engine control, the drive torque is reduced during braking, making full use of the braking power at the rear wheel. This keeps the motorcycle stable and shortens the braking distance. With the dynamic brake light (part of the optional equipment item “Riding Modes Pro” in the R 1250 GS, standard in the R 1250 RT), vehicles to the rear are made more aware of the fact that the motorcycle is decelerating.